Ford Motor Company is probably the most important automobile manufacturer in the industry’s history for the way it pioneered new processes like the modern assembly line and how it produced the first cars affordable to the common citizen, with interchangeable parts which were cheap to run but large enough to seat a family. In 1999, Ford’s Model T was voted by the automotive industry to be the most influential 20th century automobile. It turns out that there was already a whole series of Ford Racing games before Ford Street Racing, which is in fact the sixth instalment. If I seem surprised by this, it’s because that statistic does, somewhat, imply that they’d already released five previous games that, apparently, were enough to get them here. How? I don’t know. The title “Ford Street Racing”, while not inaccurate, is so descriptive and clinical that it betrays the focus group nature of the game. Sure, it may be true that this game is about street racing exclusively in Fords, but what the title doesn’t do is give me to a reason to be excited about it. To their credit, at least they weren’t lying. There is absolutely nothing about Ford Street Racing that makes it unique or worth playing. Playing this game is like playing the beta version of an unfinished product cancelled half-way through its development. It can only be called a video game in that it is at least interactive. I guess Ford must’ve looked at what the OutRun games did for Ferrari and figured they could make their own version. Unfortunately, even remembering how OutRun’s music sounds is a more entertaining experience than playing Ford Street Racing. Interestingly, Empire Interactive also published Starsky & Hutch – covered in my previous post – so perhaps they licensed their Gran Torino to them based on their record here. Which makes sense. It also makes sense that Empire Interactive went out of business in 2009 after struggling to sell many games for so long. I suppose that makes me one of the rare gamers to have actually played any of their titles, but Ford Street Racing is a perfect example of why that happened and also why they had it coming. There’s just a dead sleepiness to it. I think the problem comes down to it essentially being an advertisement funded by people who aren’t in the business of developing video games, so they don’t understand their appeal or how to make one that appeals. Even some music during races would at least add some sort of atmosphere. But there isn’t an atmosphere. Instead, there’s a vacuum. Surely they could at least put some traffic on the roads to make the city feel a bit more alive? Perhaps they could get away with having only 18 models on offer if there were variety elsewhere? There must have been something they could have done to liven it up a bit or add some competitive play? It plays it so safe. It doesn’t fail at anything because it’s not trying anything. The environment design, map layout and radar look very similar to Juiced (already covered here) and the menu aesthetic of cars rotating on an invisible platform against a white background looks to be taken straight out of Gran Turismo 4. This is a game that replicates the visuals of its contemporaries but without the understanding of what made them so playable. The reason that I wanted to write regularly about racing games is to disprove the common myth that they’re all the same. But a game like Ford Street Racing, if nothing else, typifies why they’re so often dismissed out of hand. It’s not a poorly developed game. It’s just unremarkable amongst a genre filled with many gems, and for reasons that could’ve easily been avoided if even some imagination had been put into it. Ultimately, Ford Street Racing‘s most notable trait is that it shows me what racing games must look like to the people who think of them as being boring clones of each other. That in itself has to be some kind of achievement, right? If that is what you think of racing games because you played one once and thought it was boring, who knows? Maybe it was this one. Obviously, it’s fair to say that I don’t like this particular racing game. But I still chose to include it in an ongoing series about them, since it is nevertheless still a case example worth studying within the genre because it’s a (fortunately) rare case of nothing but the bare fundamentals which serve as a lesson of why they’re not enough on their own. Making a video game is fairly basic when you know how – it’s making a good one that takes expertise. In a way, Ford Street Racing is the definitive racing game for showing what they are when everything else is stripped away – and in doing so, reiterating why that’s not enough. What I find so interesting about racing games is the various different ways of being creative within a format more limited than most others. What I find so interesting about Ford Street Racing is the way it demonstrates why that format requires so much creativity in order to survive. Otherwise, it’s just an empty shell. My previous post, for Starsky & Hutch (2003), was my 20th post on the Well-Red Mage. I’d like to thank the Well-Red Mage for approving my various pitches over the years – not least Racing Game of the Week, which comprises 14 of those 20 posts (that’s 70%) – as well as the Middle-aged Horror Mage for needing someone to cover him for that’s week edition of The Weekend Wizard Inn. This game was completely unknown to me, what system(s) was it available on? Judging from the pic up front, they at least got the newly released Ford GT in on the roster. But something tells me you don’t get to race Model T’s…. The version I played was for PlayStation 2, though it was also released for PSP, Windows and Xbox. I believe the Model T was available in Gran Turismo 4. I’m surprised it isn’t in Forza by now. 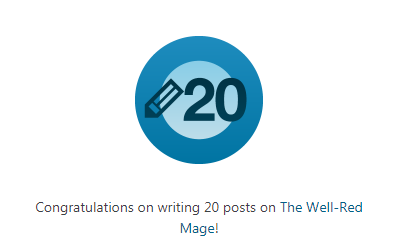 Congratulations on reaching 20 posts here. I wish you many more! Thanks for all the contributions to the concept!